The dynamics of shapes have dictated the design of this new-generation round watch which showcases audacity and ergonomics. 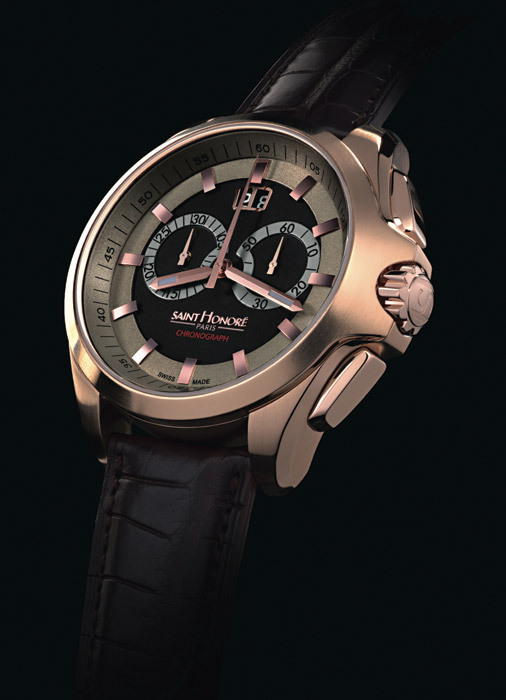 SAINT HONORE wanted a genuine masculine watch, as demonstrated in the choices made. The slender design of the case in a 44 mm diameter is perfectly trendy whilst its chunkiness lends itself to a very contemporary interpretation of the crown/crown protector assembly. The “falling” horns ensure perfect adjustment of the strap to the wrist. In short, everything in this watch evokes a movement of rare elegance. In its quartz chronograph version, the watch reveals all its class and functionality: push-pieces wedded perfectly the shape of the case, a leather strap adjusted to the millimeter, and on the dial two central counters and a big date. A desire here also to go right to the point and ensure perfect readability in all situations. Available in a quartz chronograph or automatic version, the Coloseo is yet further proof of the unique SAINT HONORE know-how in masculine watches. The new Coloseo will delight elegant men seeking a strikingly-designed watch, to be worn confidently in all circumstances.